Since 1995, Kitten has offered solutions for purity to the food and beverages, pharma, chemical and automotive markets. Based in Navi Mumbai, India, Kitten provides innovative and cost-effective products for companies who need to compete in the aggressive global market. Our four product lines keep our customers’ products and processes clean: filtration, accessories for cleanrooms, sterilization validation and sterile packaging. Today, we manufacture a broad range of products: filter elements, housings, systems and accessories for cleanrooms. All products are designed to reach maximum purity standards at the highest quality requirements. We listen to our customers needs and strive to satisfy every requirement with every order. For filtration, we produce elements and housings to global standards such as the Pressure Equipment Directive 2014/68/EDU and our quality system is certified to ISO-9001:2008. When customers require customized solutions, our design staff listens to their requirements and develops individually tailored systems, housings and even filtration elements.For cleanrooms, we produce a full range of accessories for the maintenance of process purity: garments, cleaning and packaging products. Our goal is to be your global partner for purity! 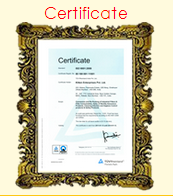 ISO 9001-2008 Certificate of Kitten Enterprises Pvt Ltd.